Nicole Kidman informing Jimmy Fallon that she was into him that one time she visited him apartment is one of the most adorable things I’ve seen in weeks. Barton’s Milk Chocolate Million-Dollar Bar. How adorable is this?? A sweets shop just opened close to where I work, and while I rarely eat candy, I did of course check out their chocolate selection and found this. How Willy-Wonka is this? Unfortunately the quality of the chocolate isn’t great, but this is a great stocking stuffer or fun/prank gift. I can tell you, some small part of me expected to find a Golden Ticket in this as I unwrapped it. Never stop living in dreams, kids. Note: you can buy these at World Market. 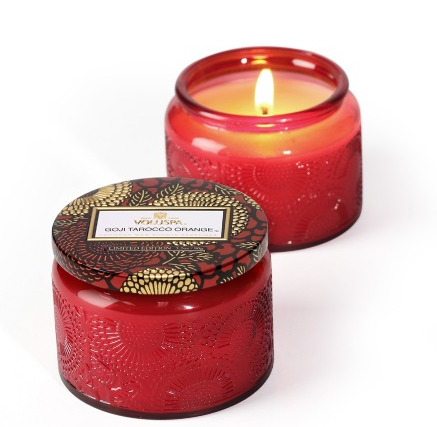 Voluspa Goji & Tarocco Orange candle. Have I mentioned before how obsessed with Anthropologie’s Voluspa candles I am? It’s really really hard to find candles that are long-burning and have a strong, lasting scent, but these are scent magic, the perfect candle. I gravitate toward citrus scents in all candles and perfume so it’s no surprise that my favorite is the Voluspa Goji & Tarocco Orange with notes of goji berry, ripe mango and tarocco orange. It’s an incredibly deep, rich, sweet-but-not-too-sweet, heavenly smell. These also burn forever and the scent, while not overwhelming, distinctively floats over the entire space, unlike every other candle brand I’ve ever tried (Luminesccence which Sears sells comes in second, but has a much more bland scent range). And finally, this music video for Kdrama Pinocchio is gorgeously romantic.